The California State Lottery started in 1984 with the creation of the California Lottery Commission through Proposition 37, or the Lottery Act of California. As the state’s official lottery operator, the commission is charged with generating supplemental funding for public education. It first sold lottery tickets in October 1985. Since then, it has funneled more than $30.9 billion into California’s public schools, colleges, and other educational institutions. You can buy tickets for California lottery games from any of the 23,000 authorized retailers throughout the state. The official California State Lottery site has a handy “Where to Buy” section that helps you search for retailers that sell tickets for your chosen games. Better yet, the site offers a “Lucky Retailer” list that points you to retailers that have paid out the most prize money in the past year. You have up to 180 days to claim prizes for any winning tickets. The only exceptions: jackpot-winning Powerball and Mega Millions tickets, which are valid for a year. Can I buy CA Lottery tickets online? No. The California State Lottery doesn’t offer online play, nor does it authorize or support the sale of lottery tickets online. You can buy tickets at your nearest authorized retailer using cash or credit and debit cards. The California lottery also has extensive networks of self-service ticket stations and scratchers vending machines so you can pick up tickets conveniently — even while filling up at the gas station. Most of these machines only take $1, $5, $10, or $20 bills. Play at the Pump machines, though, will let you pay through your credit or debit card. The SuperLotto Plus jackpot starts at $7 million, and the pot rolls over until somebody wins. The SuperLotto Plus’ largest jackpot yet is $193 million. SuperLotto Plus draws are held every Wednesday and Saturday at 7:57 PM PST. The Fantasy 5 offers better odds and daily draws, perfect for avid lottery players. You only need to choose 5 numbers, each from 1 to 39. If all your numbers match the ones selected during the draw, you win the jackpot. Fantasy 5 players have a 1 in 576,000 chance of scoring the jackpot. The odds of snagging any prize, though, are about 1 in 9. Fantasy 5 draws are held every day at 6:30 PM PST. Daily 4 draws are held every day at 6:30 PM PST. The Daily 3 takes place twice a day, giving you even more chances of winning. You only need to select 3 numbers from 0-9 then pick your play style and draw schedule. Like the Daily 4, you can choose from Straight (a 1 in 1,000 chance of winning), Box or Straight/Box (both at approximately 1 in 333). The Daily 3 has daily draws at midday (1 PM PST) and in the evening (6:30 PM PST). You select the horses you think will finish first, second, and third — 3 horses in all. You get different prizes depending on how many horses and places you match, as well as whether you match the Race Time. If you pick all 3 winning horses in the correct order and get the right Race Time, you net the Grand Prize. Considering how complicated the game is, it’s not surprising to find grand prizes in the hundreds of thousands for each game. Draws are held every day at 6:30 PM PST. Hot Spot is another lottery game with a refreshing system. Here, you pick the set of numbers, or Spot, that you’d like to play per draw. A set can be 1-10 numbers. Then, you fill out each set with numbers from 1-80. You win prizes by matching the winning numbers — and the bigger your Spot or set (meaning, the more numbers you have to match), the bigger your prize. Draws are held every 4 minutes — perfect for a quick game. The California State Lottery claims to give out tens of millions of dollars in prizes every week. 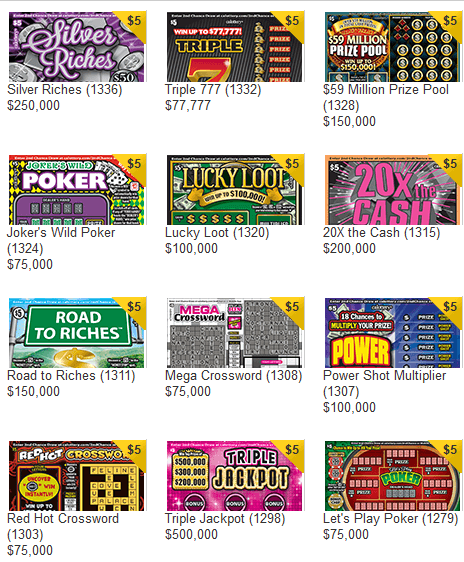 The California State Lottery runs numerous scratcher games at price points that run from $1 to $30 per card. The top prizes range from $100 to $10,000,000. Second chance games give you another chance to win prizes with your non-winning lottery tickets. Many lotteries simply ask you to submit your tickets for a chance to win. Prizes can go as high as $100,000. To learn more, check out our article on second chance games. How does Second Chance work for the CA Lottery? Tickets for these games come with a second chance code that you can submit online if you want to join a draw. The California Lottery’s system automatically enters your code into all applicable draws (e.g., the weekly pool, a promotional draw, etc.). If you have multiple non-winning tickets, you can submit these to the same draw to boost your chances of winning. The California State Lottery headquarters are at 700 North 10th St., Sacramento, CA 95811. You can also send an email through the official California Lottery website’s contact form. 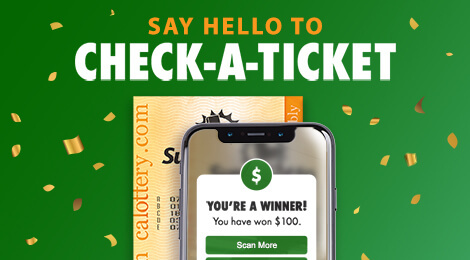 The California Lottery website also lets you create an account to enter second chance games, get jackpot alerts, and more.